3. Finally, the population density quickly increases resulting in a mature biofilm. Biofilm is the substrate conducting to settlement and adhesion of other biological and inorganic materials. In general, “macro-fouling” refers to the growth of crustaceans (Barnacles), molluscs (Mussels and Clams) and Coelenterates (Hydroids), whereas “micro-fouling” is referred to algae and bacteria. 3. Less operational time because more shutdowns are necessary to clean or repair the equipment. d. pH and suspended solids. Chlorine (as hypochlorite or chlorine gas) and chlorine dioxide are two of the most common biocides, used in many applications. 1. 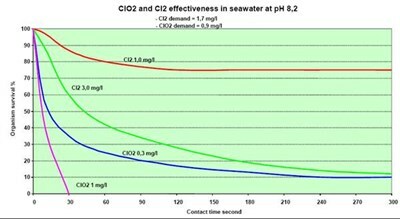 Chlorine dioxide has a biocide activity that is constant over a wide range of pH (6-9), this fact makes it suitable for sea water systems (pH>8).When pH is higher than 8, the active species, i.e. the efficacy, for the equilibrium NaClO/ClO- decrease (-80%). 2. Using chlorine dioxide, there is no formation of halogenated compound (as TTHMs) and bromate, which are hazardous for human health (and in outlet water to environment for animal species). 3. Chlorine dioxide is much more soluble in water than chlorine (10gr/l), so the diluted solution used in ISIA plants (1-2gr/l) are widely below the solubility and this fact increases the intrinsic safety. 4. Chlorine dioxide is not affected by hydrolysis. The immediateness of the biocide effect also allows for different dosing strategies, i.e. shot modes, when normally with hypochlorite a continuous dosing is required. This implies a greater consumption of the latter to have the same – or less- efficacy. 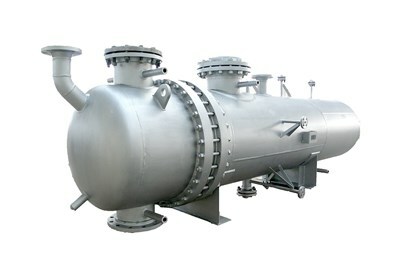 The use of chlorine dioxide, thus, allows the plant to very effectively prevent growth and the plant can be compliant with all environmental permit conditions. EasyaReadox: a proper monitoring system can be the “Brain” of the treatment program. It manages to inject chlorine dioxide in a proper quantity and at the right moment, saving material and protecting the environment. Additional benefits are accomplished in annual cost and safety.